This WE I played with XUL and Firefox 1.5. This last version of firefox allows to write SVG (a XML-based vectorial drawing format) within the html code (see http://developer.mozilla.org/en/docs/SVG_In_HTML_Introduction) I wondered if it was possible to display the features of a genbank sequence as SVG into a XUL window. I still had problems with the XUL layout and I was not able to display more than one tabpanel (the others were frozen). But creating such image on the fly could be great way to display interaction genomic maps. 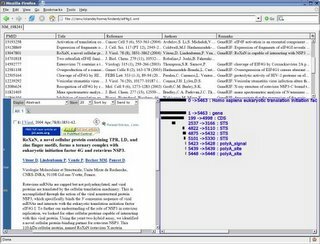 As an example, the UCSC genome browser (aka golden path) might use this system to display its tracks and make it interactive.